Perry - 1750 sq. ft. 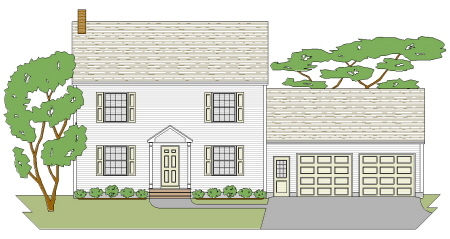 This traditional 3 bedroom colonial home plan may appear small but it has comfortably sized rooms throughout. It has a country kitchen, large living room and a den or home office on the first floor, and three large bedrooms upstairs. We can add a porch, or a 1 or 2 car garage if you wish. 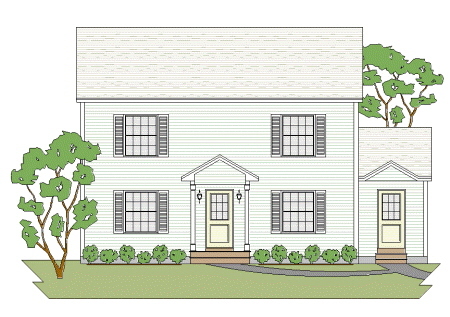 This 3 bedroom traditional colonial home plan with a porch has an open concept kitchen, dining, and living room with a multi function front room on the first floor.Upstairs there are three comfortably sized bedrooms and 2 bathrooms. We can easily add a 1 or 2 car garage if you wish. 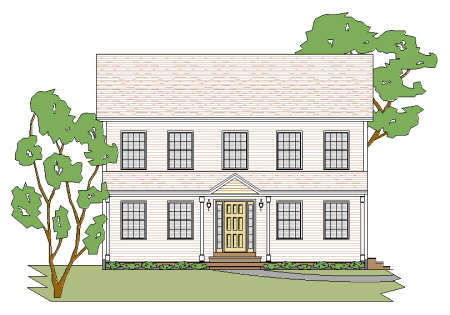 This small traditional colonial home plan is another one of our popular colonial plans for young couples. It's affordable in every way. The first floor offers a large kitchen and dining area, a den or home office, and a large living room. The second floor has large bedrooms and the 2 car garage can be done now or later. 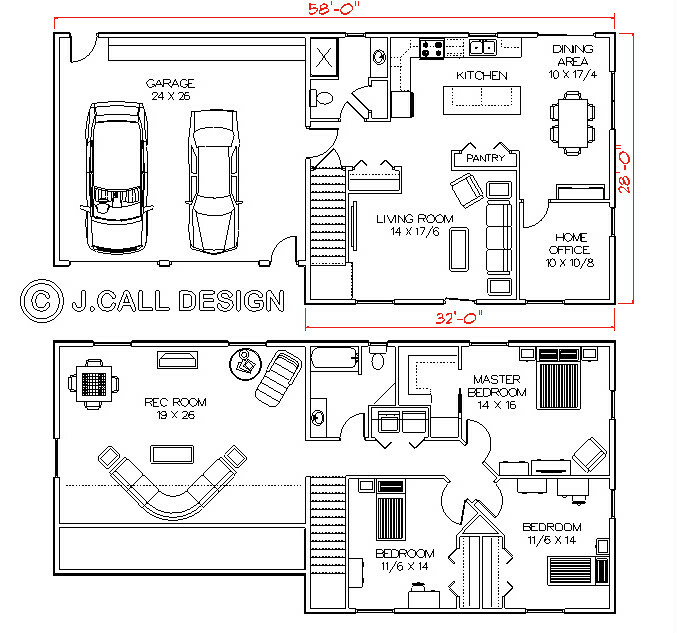 This traditional 3 bedroom traditional home plan has a kitchen with an eat at island, a formal dining room, a large living room and a 3/4 bath and laundry. The second floor has 3 larger than average bedrooms and 2 baths. If you wish we can add a 1 or 2 car garage. 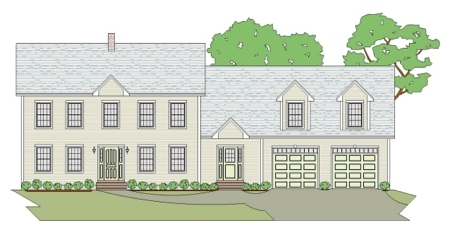 This nice looking traditional colonial home plan will fit in anywhere in New England. The first floor has an open concept kitchen dining and family area, a formal living room and a 1/2 bath and laundry. The second floor has large and comfortable rooms. We can add a 1, 2, or 3 car garage if you wish. 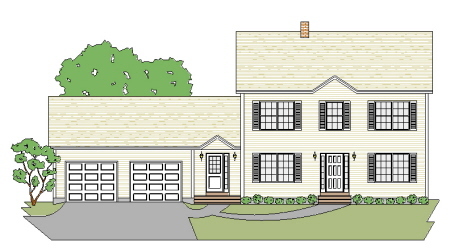 This 3 bedroom traditional colonial home plan has a porch, a breezeway, and a 2 car garage. The first floor has an open concept living area, a large walk in pantry and a den, playroom, or home office. The second floor has 3 comfortable bedrooms and 2 baths. 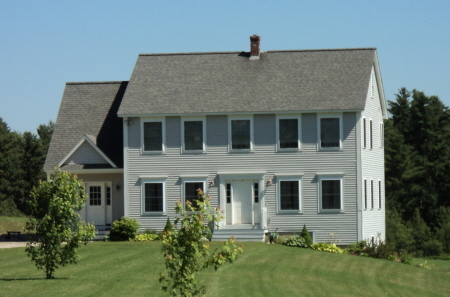 This tradition colonial home plan is just under 2000 sq. ft. First floor has a large country kitchen, a large living room and a formal dining room, 1/2 bath, laundry, and a two car garage with a cellar entry into the full basement. The second floor has 2 large bedrooms, a double duty bath for the kids, and a large walk-in closet for the master suite. 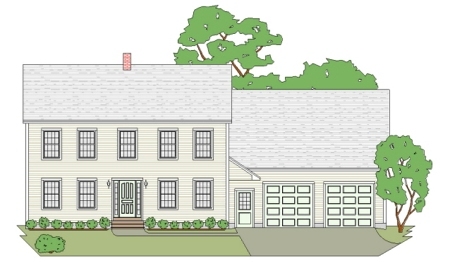 This attractive hip roof traditional colonial home plan has an open concept first floor, with a breezeway (mudroom), a 1/2 bath and a laundry. The second floor has 3 comfortable bedrooms and 2 bathrooms. The 2 car garage has easy access to the full basement. 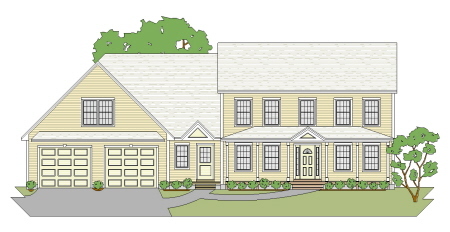 This 3 bedroom traditional colonial home plan has a side entry and 2 car garage with cellar entry. The first floor has a 3/4 bath, laundry kitchen and dining area, large living room, and a "whatever you want it for" front room. The second floor has 3 comfortable rooms, and two bathrooms. 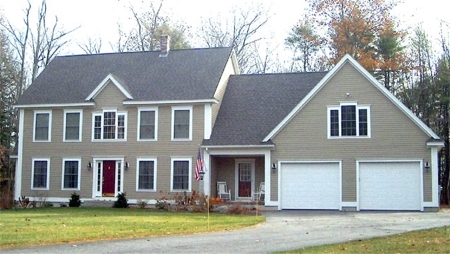 This nice looking traditional colonial home plan will fit in anywhere in New England. The first floor has an open concept kitchen dining and living room, with a 1/2 bath, laundry, and "whatever" room. The second floor has large and comfortable rooms, a double duty bath for the kids, and a nice master suite. We can add a 1, 2, or 3 car garage if you wish. This 3 bedroom traditional colonial home plan has an open concept living area on the first floor, a 1/2 baths and laundry, and a "whatever" room on the first floor. Large rooms up, a double duty bath for the kids, and a great master suite finish it off. We can add a 1, 2, or 3 car garage if you wish. 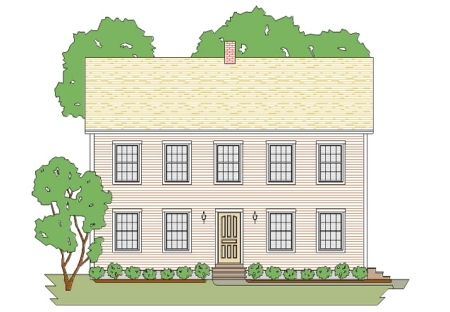 This traditional 3 bedroom colonial home plan can have great curb appeal. 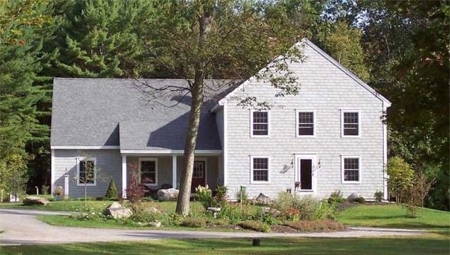 This Maine home plan and design fits in anywhere in New England. A great first floor semi-open concept first floor backed up with a nice second floor plan. 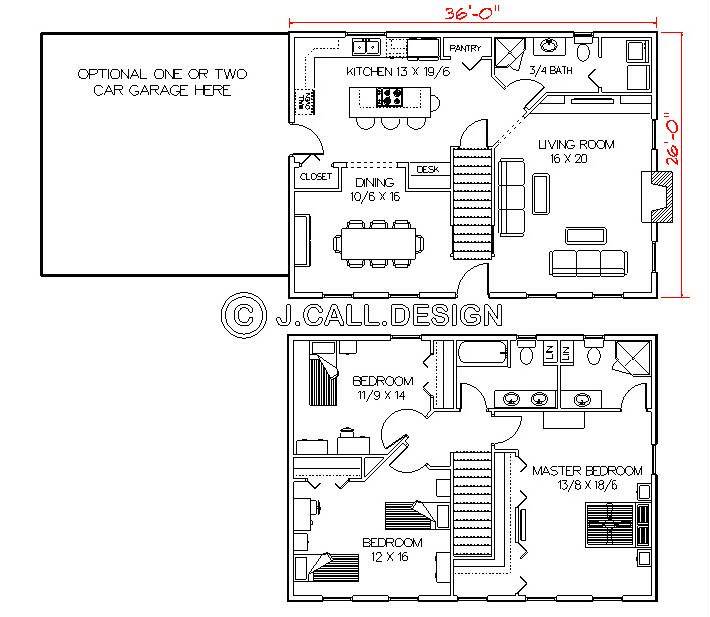 The 2 car garage has easy access to the full basement and to the storage above. This home plan may look like a traditional colonial home on the outside but the easy living interior is planned for today's living. A large semi-open concept living area, a breezeway (mudroom) and a "whatever room" please on the first floor, while the upstairs suffers nothing with comfortable rooms, a double duty bath for the kids, and a nice suite for the Mr. and Mrs. The 2 car garage offers easy access to the second floor. The farmhouse look of this 3 bedroom traditional colonial house plan with its side entry breezeway and garage make you think it is much older than it really is. A large country kitchen/family room could be used as shown or with a dining room table by the fireplace. The front room could be dining, den or "whatever". Upstairs lacks nothing. Large rooms, a double duty bath for the kids, and a nice master suite. The 2 car garage has our easy access to the full cellar. 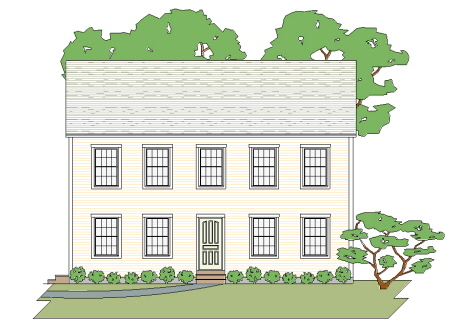 Mulled windows, shutters, a front porch, the breezeway, and 2 car garage give this traditional 3 bedroom colonial home plan plenty of curb appeal. The semi-open concept first floor living give it a feeling of space, and the well laid out upstairs works well for a family of 4. The 2 car garage has our easy access to the full basement. 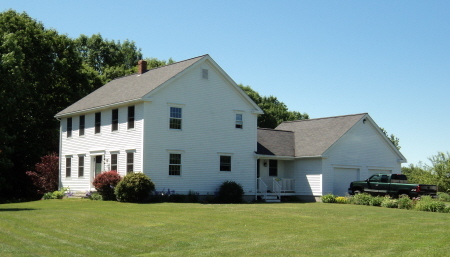 The first floor of this traditional colonial home plan has a semi-open concept living area and a "whatever you want" room on the front.The second floor has 3 nice sized bedrooms, two baths and a laundry. The 2 car garage has easy access to the basement. 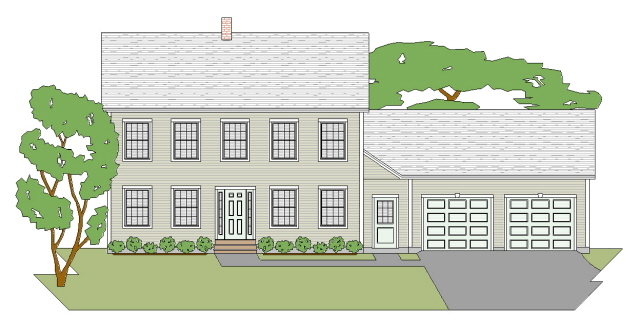 This 3 bedroom traditional colonial home plan has a kitchen with dining area, living room, den or home office and a 3/4 bath downstairs. The 2nd floor has 3 large bedrooms, a bath, laundry and a large recreation room. 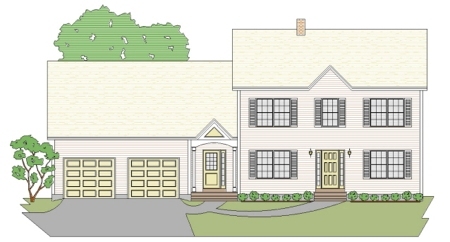 This 3 bedroom traditional colonial home plan is the same plan as the Liberty A but instead of storage above the garage it has a recreation room. 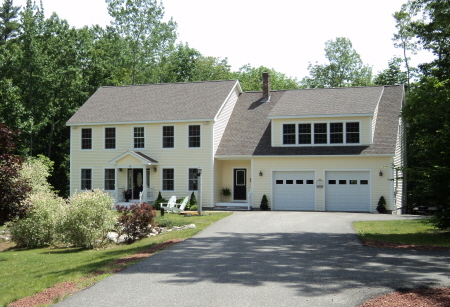 It has the same semi-open concept first floor plan, and the same large bedrooms upstairs. The 2 car garage has our easy entry to the full cellar. This 3 or 4 bedroom traditional colonial home plan has the look of an old farmhouse, but the inside is designed for today's living. The first floor has an open concept living area, a formal dining room, a den, home office or 4th bedroom, and a full bath. Upstairs are two large kids rooms which share a double duty bathroom, a laundry, and a great master suite. The large garage that will fit 3 cars has our easy entry to the full cellar. 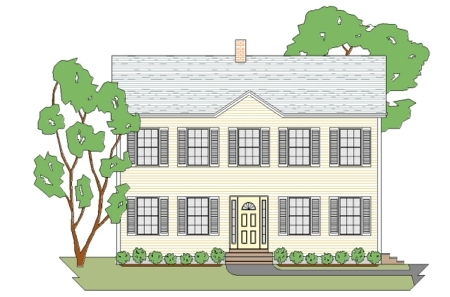 This tradition colonial home plan has the same floor plan as the Harmony A plus an added recreation room. It has a large country kitchen, a large living room and a formal dining room, 1/2 bath, laundry, and a two car garage with a cellar entry into the full basement. The second floor has 2 large bedrooms, a double duty bath for the kids, and a large walk-in closet for the master suite. Newfane - 2665 sq. ft. 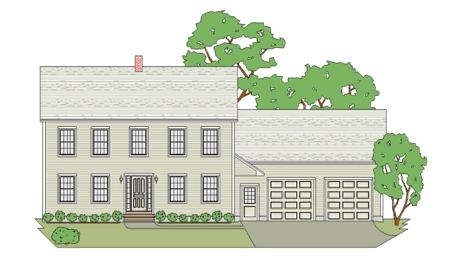 This tradition 3 bedroom colonial home plan has a large country kitchen, a large 2 story living room with a fireplace, a den, home office or 4th bedroom and a full bath on the first floor. The second floor has 2 large kids bedrooms that share a double duty bath, and a glorious large master suite. The large 2 car garage has easy access to the cellar. If you don\'t like the hip roof we can replace it with a gable roof. 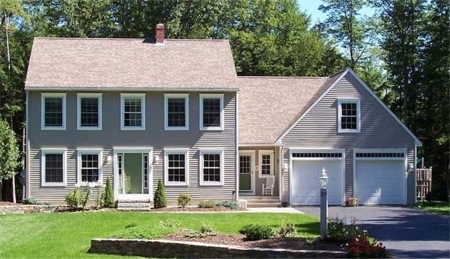 Wilton - 2700 sq. ft. 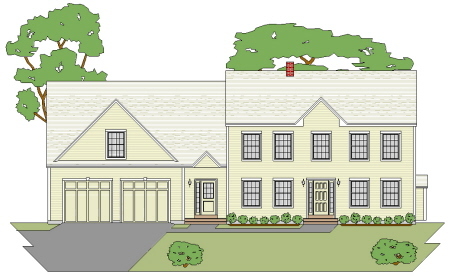 This looks like a traditional 3 bedroom colonial home plan from the outside but the inside is different and unique. The first floor has a breezeway (mudroom), a semi-open concept kitchen and dining area, a large living room and a home office. Upstairs are two large kid\'s rooms with a double duty bathroom to share, a nice master suite, and a large recreation room above the 2 car garage. 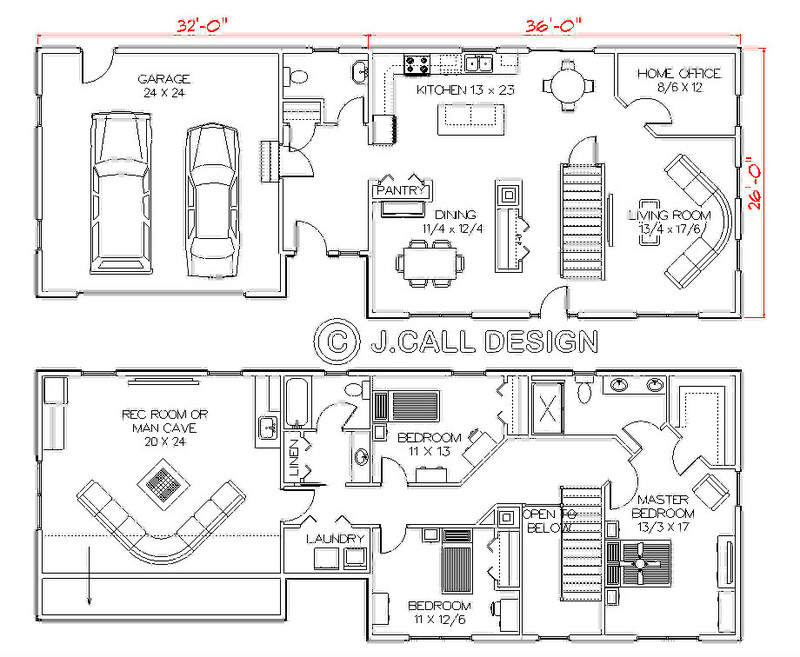 Like the floor plan? We can dress up the outside with a porch across the front, or dormer/s on the garage. Stratton B - 2748 sq. ft. 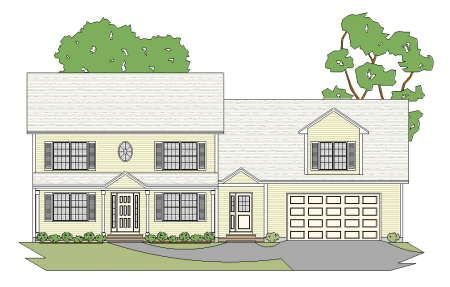 This 3 bedroom traditional colonial home plan gains curb appeal with the roof \"crickets\" over the breezeway and front entry door and the roof over the garage doors. The first floor has a country kitchen, large living room, a 1/2 bath and laundry, and a \"whatever\" room on the front. The second floor has 2 large bedrooms for the kids with a double duty bath, a real nice master suite, and a recreation room or man cave. The 2 car garage has our easy access to the basement. Gorham B - 2747 sq. ft. The semi-open concept first floor living in this 3 bedroom traditional colonial give it a feeling of space, and the well laid out upstairs works well for a family of 4. 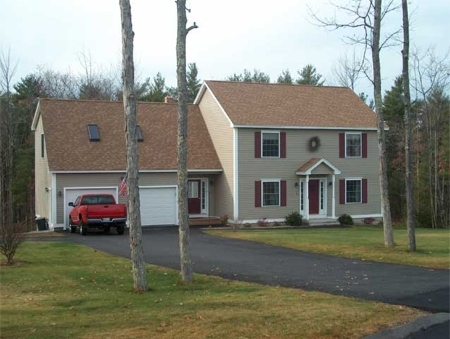 The 2 car garage has our easy access to the full basement.This is the same plan as the Gorham A but with a man cave or recreation room over the garage. 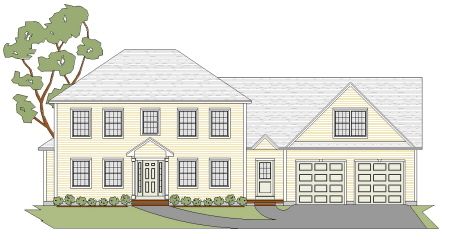 Similar to its cousin the Bremen A, this 3 bedroom traditional colonial home plan has a porch, a breezeway, and a 2 car garage. The first floor has an open concept living area, a large walk in pantry and a den, playroom, or home office. The second floor has 3 comfortable bedrooms,2 baths and a large recreation room or man cave. The first floor of this traditional colonial home plan has a semi-open concept living area and a "whatever you want" room on the front. The second floor has two good-sized kids rooms that share a double duty bathroom, a great master suite and a large recreation room or man cave over the 2 car garage which has easy access to the basement. Similar to the Stratton A and B this 3 bedroom traditional has old fashioned curb appeal. The first floor has a country kitchen, large living room, a 1/2 bath and laundry, and a "whatever" room on the front. The second floor has two large bedrooms for the kids with a double duty bath, a nice master suite, and a recreation room or man cave. The 2 car garage has our easy access to the basement. 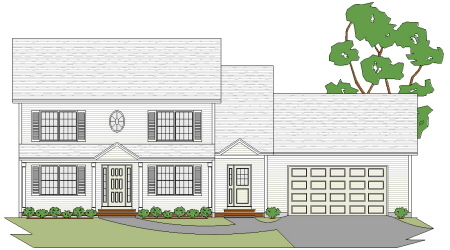 This beautiful 3 bedroom traditional colonial home plan has a lot going for it- top curb appeal and a great floor plan. The first floor boasts a country kitchen with a bump out breakfast bay and a large pantry, a large living room with a fireplace and a formal dining room. The second floor has an open foyer, two nice sized kids rooms and a double duty bath for them, a laundry room, and a great master suite to hide away in. The 2 car garage has easy access to the basement and a man cave or recreation room above. 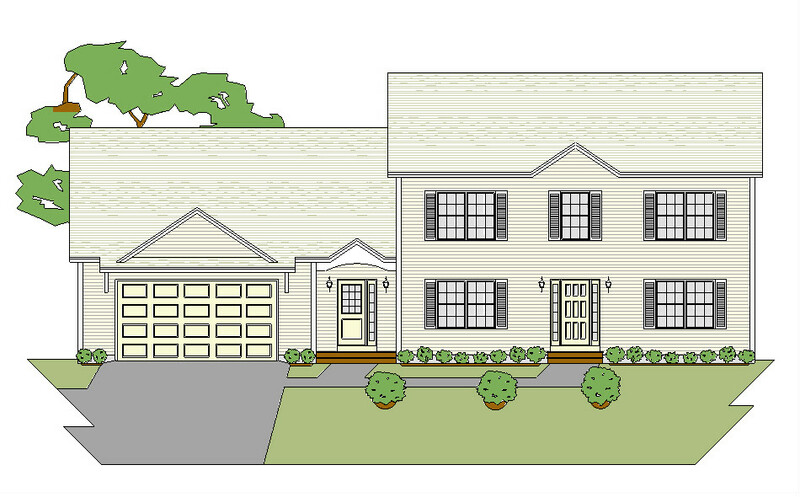 This is great looking 3 bedroom traditional colonial home plan. The first floor has a large country kitchen, a large living room, and a "whatever you want" room on the front. The second floor has two large bedrooms for the kids, a wonderful master suite to get lost in, and a man cave with a storage area. The 2 car garage has our easy access stairs to the basement. 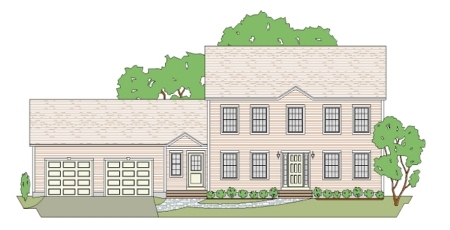 This great looking 3 bedroom traditional colonial home plan has a lot going for it. The first floor has a country kitchen with a fireplace, a large living room, a laundry, and a formal dining or whatever room on the front. The second floor has two good sized rooms for the kids, their bathroom, a nice master suite and a very large recreation room or man cave. The 2 car garage has our easy access to the basement which eliminates the need for a bulkhead. Traditional styling at its best. 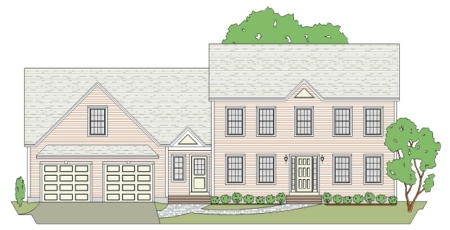 This 3 bedroom colonial home plan has many amenities. The first floor has a large kitchen and breakfast area, a formal dining room, a large living room, and a den or home office. The second floor boasts good sized rooms for the kids who share a double duty bathroom, a master suite that rivals a high class hotel suite, and a large recreation room. The 2 car garage has our very popular cellar entry. Take a ride to grandma's house. 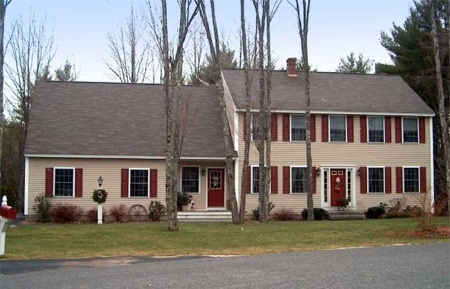 This beautiful farmhouse style tradition colonial offers much more than 3 bedrooms. It features great first floor plan with a country kitchen, large living room, a den or guest room and a laundry and 3/4 bath. Upstairs we have 2 good sized rooms for the kiddies and a double duty bath for them to share, a wonderful master suite with a walk-in closet to get lost in. 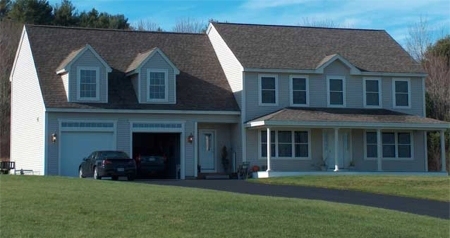 The large 2 car garage has our entry to the basement and a man cave or recreation room above. 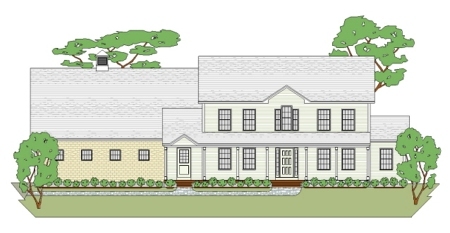 This great looking traditional colonial home plan has style! First floor amenities include a country kitchen, large living room with a fireplace, a den or home office, and a formal dining room. Upstairs we have two kids rooms and a double duty bath for them, a really nice master suite, a laundry, and a large recreation room or man cave. The 2 car garage has our popular cellar entry to the basement.